In these very uncertain times it seems all the more important to recognise and celebrate the wonderful contribution that European citizens make to Scottish society. Camphill in Scotland has more reason than most organisations to value this contribution. Camphill was formed in Scotland in 1939 – but not by Scots. It was created by a group of Austrian refugees. The founders of Camphill were a group of successful and well-educated Jewish professionals interested in the ideas of Rudolf Steiner. They believed in the equality of people with learning disability at a time when many countries, including the U.K. were influenced by eugenics – the idea that the human race could be genetically ‘improved’ by scientific and social interventions. The founders of Camphill fled Austria after its annexation by Germany in 1938. They arrived in Aberdeen with only one of them able to speak English, cut off from their social networks and dependent on others’ charity. As is the case with many refugees they displayed a tremendous inner strength and worked very hard to make a new life. Together, they created the first Camphill community at Kirkton House in Aberdeen. They wanted to build a community life where each person’s social, cultural and spiritual needs could be met and each had the opportunity to make a valued contribution to community life through their work. Camphill is now a worldwide network of educational and social services for people with learning disabilities and other support needs. There are 119 Camphill places in 25 countries across the world. There are eleven Camphill communities in Scotland including two Schools, eight adult communities and one for older people. Together, they provide services to around 650 people with learning disabilities and other support needs. Camphill in Scotland is not only indebted to Europe for its original creation it remains fundamentally a European and international movement. This is graphically illustrated by the make-up of the current workforce in Camphill. In Camphill there are three categories of worker providing social care and education. There are 165 long term vocational workers of whom 88 or 53% are from other EU countries. There are 469 employees of whom 96 or 20% are from other EU countries. Finally, there are the young people who live and work in the communities as volunteers for around a year or 18 months. In 2016 there were 251 such volunteers and 170 of them were from other European countries. That is 68%. The opportunity to come to a different country and meet people of different nationalities is a big part of what makes the Camphill volunteering experience attractive. It is an opportunity for young people to test themselves, grow and develop as individuals. They live and work in the community 24 hours a day alongside the people they support. 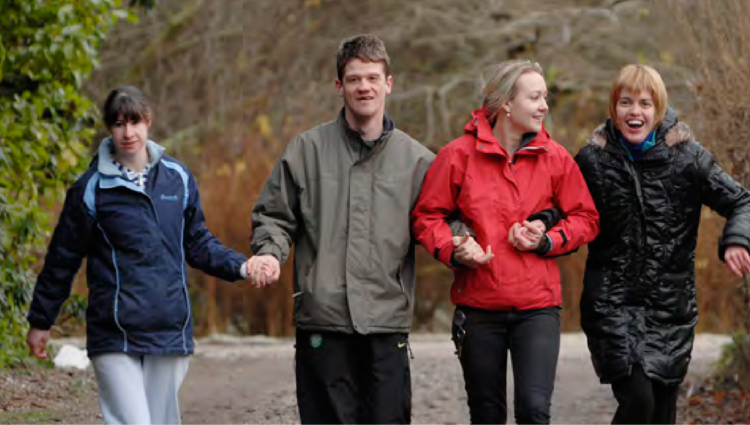 The vibrant mix of cultures and the opportunity to meet idealistic, energetic young people makes Camphill a distinctive provider of care and education for people with learning disabilities. Brexit puts three obstacles in the way of maintaining this. Firstly, it puts people off coming. Secondly, the new post-Brexit immigration system seems likely to make it more difficult for people to come even if they want to. Thirdly, it will make it more difficult for people to stay long term. We know Brexit is already putting German volunteers off. We have good links with the German volunteering agency Freunde Waldorf. They told us that, in January 2018, 549 young German volunteers applied to come to the UK. After another year of the Brexit process, in January 2019, there were 169 applications. That is a drop of 70%. Furthermore, any post-Brexit immigration system will treat Europeans in the same way as other nationalities. We know that this is not good news because we are well aware of the difficulties that other foreign volunteers can have in gaining visas. From September 2017 to March 2018, for example, there were 48 applications from international volunteers to come and work with us. 20 of these were refused. That represents an increase of 50% on the previous year. There would seem to be no change to the technical requirements in relation to the visas but the rules seem to be interpreted in a more unsympathetic way. For example, one applicant was asked whether she would be earning a wage while with Camphill. She said no but added that she would get £165 per month for living expenses. The visa was refused as £165 per month was considered to be a wage – that works out at around £5 per day! A potential volunteer at Blair Drummond here in Stirling was refused a visa because, when phoned at 11 pm her time, she could not tell the interviewer what Blair Drummond’s post code was. Evidently for the interviewer, this meant the volunteer was not serious about her application. If EU volunteers have similar problems under new immigration arrangements, there are Camphill communities in other parts of Europe and further afield that they can go to instead. Finally, the post-Brexit immigration system will be bad news for Camphill because it will serve to prevent those who come as volunteers from staying long term. This is because only skilled workers can stay long term – and you may be classified as a skilled worker only if you earn a minimum of £30,000 per annum. For comparison, a Senior Support Worker at the Corbenic community near Dunkeld earns between £18 and £19 thousand per annum. As you can see, by potentially cutting off Camphill in Scotland from Camphill in Europe, Brexit poses a very real and profound threat to Camphill and the people with learning disability and other support needs that we serve in Scotland. We are trying hard to tell the world how much we care about and value the European workers who choose to live and work with us. This is a message we give on our website, our social media work and through events like these. We are also working with our European volunteering partner Freunde Waldorf to see how best we can maintain the flow of volunteers. Freunde travelled from Germany last week to talk with us about how best to address the impact of Brexit and continue to attract volunteers. We have also been lobbying for legislation that would serve to safeguard the health and social care sector after Brexit. This legislation would require the UK Government to make arrangements for an independent evaluation of the impact of Brexit upon the health and social care sector across the 4 Nations. We have been joined in this campaign by 101 other organisations. We continue to work with others to lobby for a future immigration system that understands and facilitates the vital contribution that European volunteers make to the Camphill experience. At the same time we are working with our members to help them consider how they could manage if Brexit were to impact on the number of volunteers wishing and able to work with them. Understandably, many communities are reluctant to countenance this as it is such a central part of Camphill identity and they know the value created by the current model. Inevitably, a reduction in the flow of volunteers would move Camphill towards a much more conventional social care model with employees engaged on a shift basis. This is no substitute for volunteers sharing their lives with people on a more informal and more complete way. Camphill would continue but some of the vibrancy and depth of community life would be lost. Yet, like everyone else, we must be prudent of course and make contingency plans. As I said at the start of this piece, at this uncertain and fractious time, it is more important than ever to recognise and celebrate the contribution of EU citizens across Scotland. In Camphill we recognise the fundamental debt we owe to the Austrian citizens who established the movement in 1939 at a time of division and nationalism across Europe. Camphill is very proud to be a European movement and our communities remain a vibrant mix of European and other nationalities. We will do everything we can to enable the vulnerable people we look after to benefit from the communities we create together.